In the five years I've been teaching as an adjunct instructor at Belmont University, one of the things I've noticed is a real lack of reading comprehension and retention. This next phrase is merely anecdotal observation of the 'Net-enabled age, but it feels like unless it's front of mind, people are overly reliant on the opportunity to Google something or Yahoo something or now Bing something and call it knowledge. Hence, a decrease in the perceived need to read and retain. So I tried a little object lesson. Granted, during my collegiate days way too many years ago, did I always read over the exam before starting to churn through it? 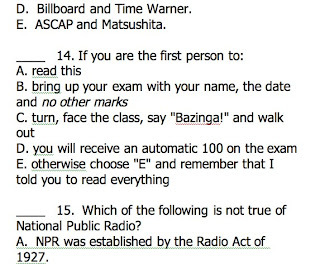 No…as my GPA clearly indicated. 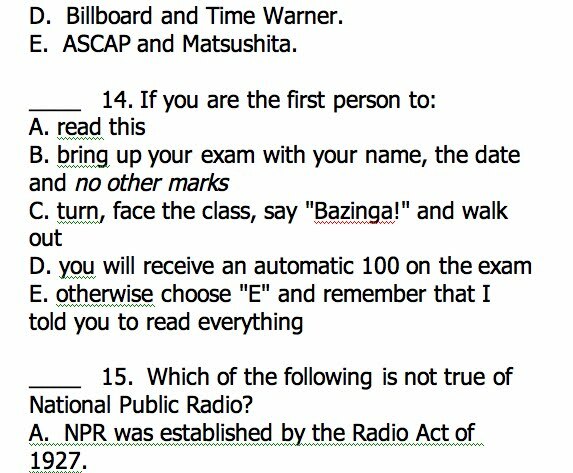 But here is what I dropped into the text of the third exam of the spring '10 session of my Mass Media & Society class. And yes, it was absolutely real. And no, nobody picked up on it until it was too late. The one "outside the classroom" lesson I've carried with me from college was the destructive power of the assumptive leap, that A plus B definitely does not always equal C.
Lesson (hopefully) learned for my students today: Look before you leap, and READ BEFORE YOU ACT.